The countdown has begun. Christmas decorations have been popping up in stores since October – a little ridiculous, if you ask me! Black Friday, traditionally the Friday after Thanksgiving – and the busiest shopping day of the year- began weeks ahead of schedule. Enough already! It’s time to take a deep breath, and focus on the true meaning of the holidays – the “reason for the season”, family, friends, food, and good cheer to all. 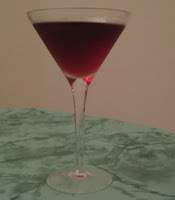 To begin the festivities, I’ve selected a cocktail recipe to help get you in the mood. This comes from one of my favorite magazines, Southern Living’s December 2010 issue. Because it contains pomegranate juice, the cocktail is billed as “healthy”. We all know that the pomegranate, one of our favorite Armenian fruits, helps to keep our cholesterol in check, is a good source of fiber, protects our skin, and helps prevent arthritis. But did you know it also keeps your teeth clean by helping to rid your mouth of plaque, a cause of gingivitis? Now that you know, sit back, relax, and enjoy the holiday season! But, please, drink responsibly! Pour 2 Tbsp. refrigerated 100% pomegranate juice and ½ cup chilled Prosecco or other sparkling wine into a champagne flute (or as in our photo, martini glass). Oh, this does look fantastic. I just introduced our daughter to fresh pomegranate and she loved it. I don't think I'll introduce her to this drink, but I'll be enjoying it.